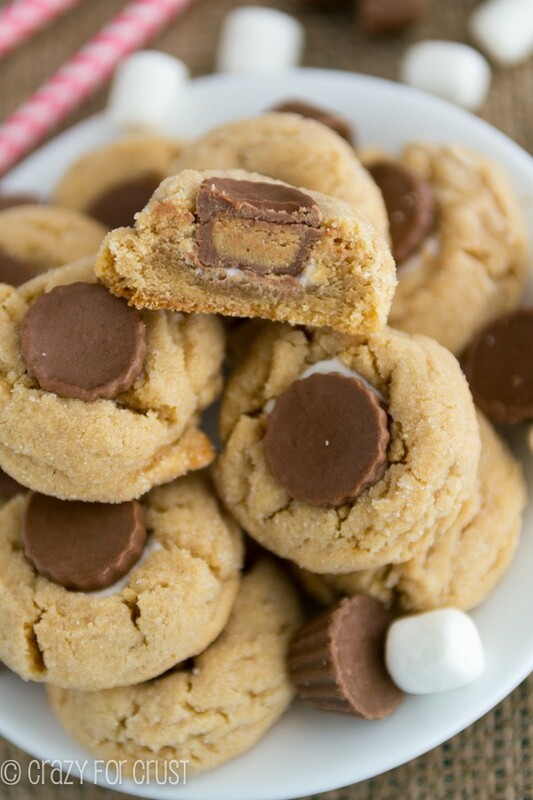 Peanut Butter Blossoms are probably my favorite cookie – and not just at the holidays. But you know what makes blossom cookies even better? Adding a mini Reese’s Peanut Butter Cup. Know what makes them infinitely better? Add a mini marshmallow. Peanut Butter Blossoms + Peanut Butter Cup + Marshmallow = S’more Blossoms…My favorite new way to eat a s’more! Jordan won’t stop losing teeth. I mean, I know they’re just baby teeth. I know it’s supposed to happen. But I swear, it’s like a cartoon in here: one falls out and three more follow. It feels like she’s been losing teeth forever…probably because she has. She’s been losing teeth for half her life, thanks to the tile floor in our old kitchen when she was 4. She had 4 baby ones pulled for braces and all the permanent ones under the surface are all piled up and rushing to the front of the line, so the rest of her baby teeth just keep falling out. Three more since January (we’re up to #15, I think, I’ve lost count) and two of those were at the orthodontist, only held in by the brackets and wires. Did you know that teeth with brackets on them are worth more? Our tooth fairy pays well for metal. If you hate teeth, I’m sorry for this post. I hate them too. But something about mini marshmallows makes me think of teeth, and when I think of teeth I think of Jordan, only I think about her drawn as a cartoon where one tooth falls out and the rest follow. 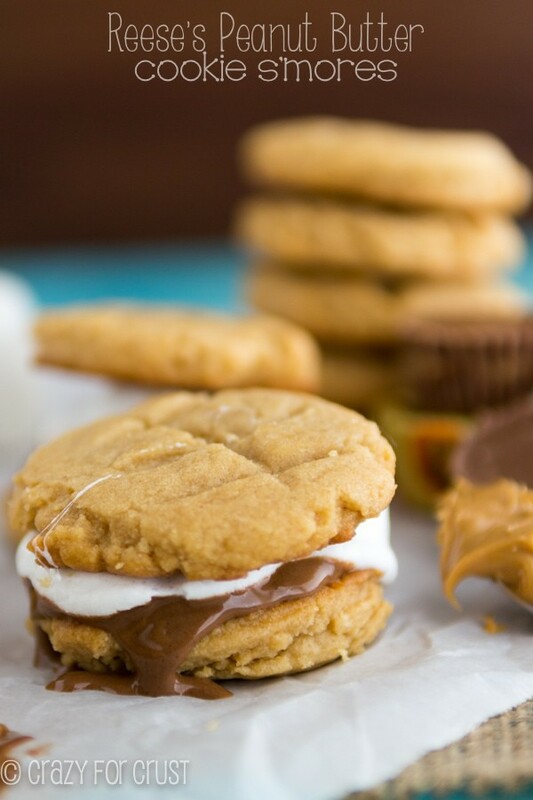 I’d be shuddering right now, but I’m going to instead think of these Peanut Butter Blossom S’mores. Cookies are better than teeth. Especially with peanut butter cups! Blossom cookies are my #1 favorite, especially at the holidays. But why do they get made only at Christmas? 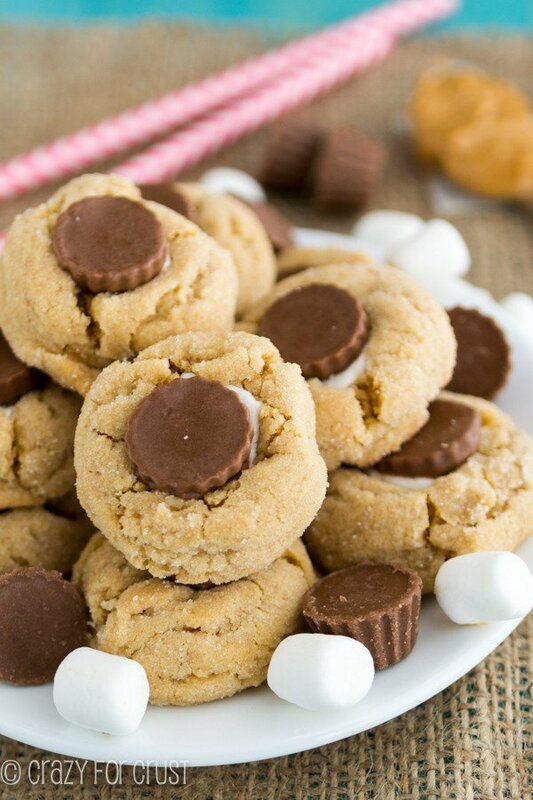 They’re a peanut butter cookie – they should be made all year long. 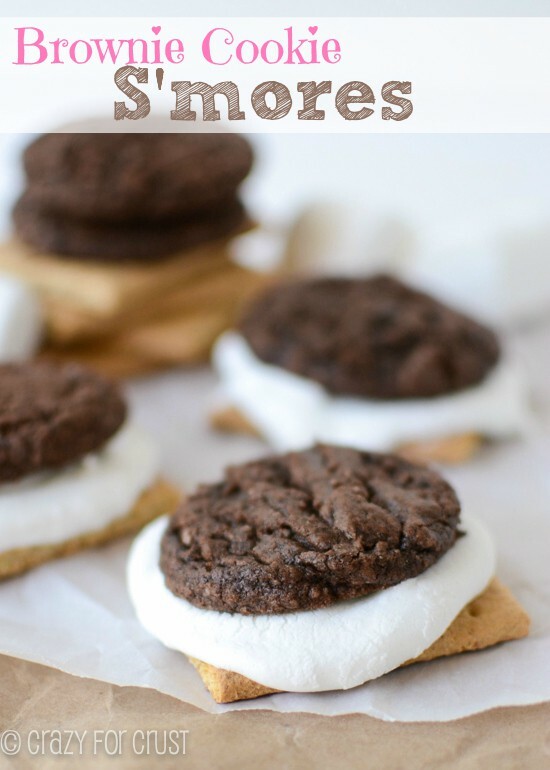 So, new solution: make them in summer but make them s’mores. That fits, right? 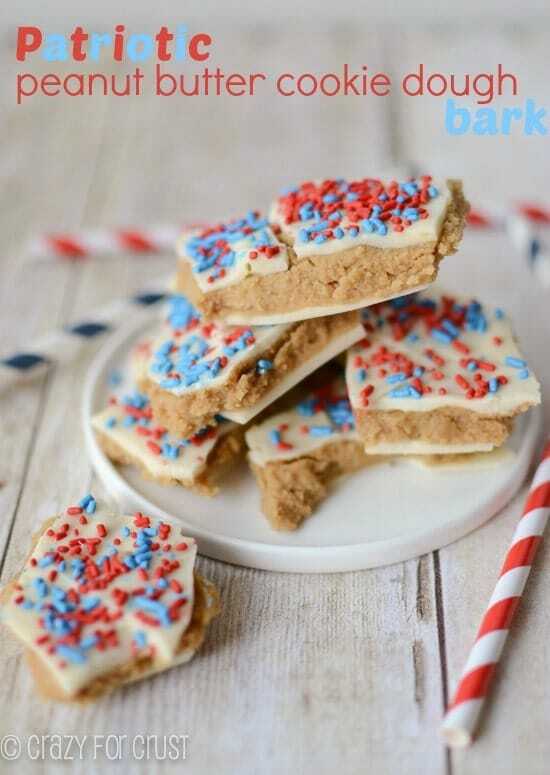 These cookies are based on my favorite peanut butter cookie recipe. I made them super small (1 tablespoon each), rolled them in sugar, and baked them. While they’re hot from the oven, I poke a little hole with the back of a wooden spoon. Press a mini marshmallow into the hole, then top it with a Reese’s Peanut Butter Cup Mini. I used the minis because they fit perfectly in the small cookie. Plus, you don’t have to unwrap them! The cookie turns out super soft, not at all fall apart and crumbly like some blossom cookies I’ve had. The peanut butter cup is the perfect addition, and the marshmallow adds a little chewiness. These are my favorite blossom cookies ever! These are so yummy just cooled, while the peanut butter cup is all melty. Once the peanut butter cup cools and re-solidifies, these are perfect for stacking or taking on the go. They can even be frozen! A peanut butter blossom with a mini peanut butter cup and marshmallow stuffed inside - a s'more blossom! Preheat oven to 350°F. Line 2 cookie sheets with parchment or silpat baking mats. Place 1/4 cup granulated sugar in a bowl and set aside. Cream butter, peanut butter, and brown sugar, and 1/4 cup granulated sugar in the bowl of an electric mixer fitted with the paddle attachment. Add egg, vanilla, milk, and salt and baking soda. Mix until combined. Slowly add flour and mix until dough comes together. Scoop 1 tablespoon sized balls of dough and roll them in the bowl of sugar. Place on cookie sheets. Bake for 7-8 minutes, until the bottoms just begin to look brown. Remove from oven and immediately press a hole in the center of each cookie with the back of a wooden spoon. Insert a mini marshmallow in the hole and place back in the oven for 30 seconds. Remove from oven and stick a Reese’s Mini on top of the marshmallow, pressing gently to fit it into the hole without cracking the cookie. Cool completely before removing from cookie sheets. Where do you come up with all of these creative ideas?? These are definitely my favorite blossom variety yet! Chocolate, extra PB, a marshmallow… And no campfires either. Yum!! 🙂 And hopefully Jordan waits a few weeks before losing another tooth. I’ll bet the tooth fairy’s wallet is getting a little light these days! I am all about Smores. I actually bought some sort of Graham Cracker smore things at the store tonight a whim. These look way better! 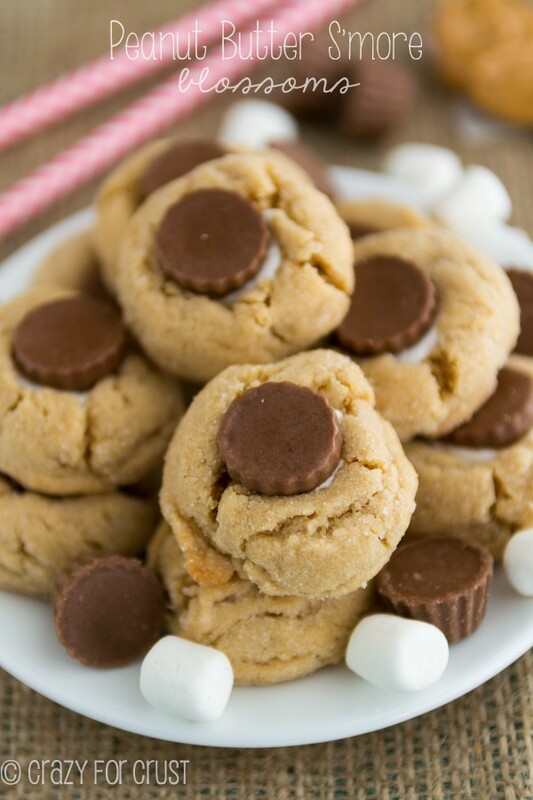 I agree 100% that peanut butter blossoms should be enjoyed all year round! Hi Dorothy,I just wanted to make sure that you used the little minis,not the bigger minis?I have a bag of the miniatures,but I couldn’t tell from your picture.Thanks so much. For these I used the little ones that come in a bag unwrapped!